Ocean dead zones -- warmer regions that hold less oxygen -- are increasing worldwide. This summer the Gulf of Mexico dead zone was 5,000 square miles along the Louisiana coast, and it's estimated to cost $82 million in lost tourism and lost fish catch. The second largest US dead zone is off the coast of Oregon -- low-oxygen water that's been appearing every summer since 2002, perhaps tied to global warming. Dead zones are caused by runoff of agricultural fertilizers, sewage around Africa and South America, and airborne nitrogen, the latter coming from cars, trucks, and coal-burning power plants in the Midwest. These particularly affect Chesapeake Bay and Long Island Sound. Chesapeake Bay has several dead zones, each where a river drains into the Bay. Don't miss reading about London's Great Stink of 1858, which brought the city to a standstill. Hey, someone is using a blog post of mine as essay material for their university class on Global Environmental Change. I've had professors use (with pay) some articles I've written for magazines -- mostly from Scientific American. But never a blog post (that I know about). That makes my day (except for the not getting paid part; not that I'm expecting that here). Court Filing: Tim Ball Not an "Authority on Global Warming"
Tim Ball's now infamous rant at WUWT seems to me to be pure desperation. Like he's so frustrated that he's nothing more than a mosquito in the scientific world, that no one who matters takes him seriously, that he's on the verge of giving up, so he finally went full Nazi and pulled the ultimate pin. Well, penultimate. The only comparison left is to Satan. By the way, Tim Ball is hardly a climate science expert, and this has been stated in a court of law. "The Plaintiff is viewed as a paid promoter of the agenda of the oil and gas industry rather than as a practicing scientist." 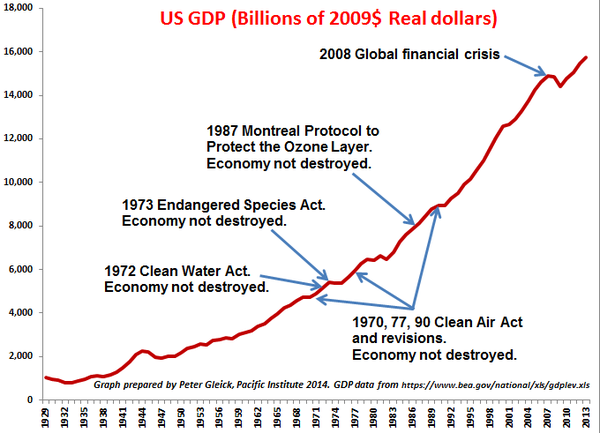 Where's the Economic Damage From Environmental Regulations? Pasting this here because it will come in handy. It's from Peter Gleick on Twitter. The ocean heat content numbers are in for the third quarter -- and they again show big increases. For the 0-700 meter region, the change from a year ago is 0.59 W/m2 (the area being the total Earth's surface). That's over twice as large as its trend over the last 15 years, which is 0.28 W/m2. For the 0-2000 m region, the change from a year ago is 1.73 W/m2, whereas its trend since its data started in 2005 is 0.58 W/m2. The top half of the ocean gained 200% more heat than it has on average. For the top 2000 meters, a quadratic fit is again better than a linear fit, with the acceleration being 0.07 W/m2 per year. There's an nice article in NCSE Reports by John Abraham, John Fasullo and Greg Laden, titled "Continued Global Warming in the Midst of Natural Climate Fluctuations," about the hiatus and all that. It's not very technical and would be a good thing for those who think the hiatus means no more global warming to read. The first figure in the article (right) reminded me of something I've been wondering -- how sensitive are atmospheric trends to changes in the 93.4% number for the percentage of heat that goes into the ocean? I think I can estimate it with some simplications. The answer is, if I'm right: surface and tropospheric temperature trends are very sensitive to changes in ocean heating. Answer below (in red), using some very basic physics that is a bit pedantic. Let Qin be the amount of heat coming into the Earth over some period of time. (So the units of Qin are energy per unit time, whereas the symbol Q is usually used for just energy.) Let's assume in all goes either into the ocean or into the troposphere, so Qin = QO + Qt, where QO is the amount of the heat that goes into the ocean, and Qt the amount into the troposphere. Now consider two scenarios. In the first, the one we're living in, a fraction f1 (= 0.934) of the heat goes into the ocean, and in the second, a fraction f2 goes into the ocean. QO,1 = f1Qin and QO,2 = f2Qin. What is Qin? It's QO,1/f1. We know what f1 is: 0.934, from the figure. If we assume all the heat coming into the ocean goes into the 0-2000 m region (that's the top half of the ocean -- and not a bad assumption), then QO,1 can be estimated from 10-years worth of Argo data for that region. When I do that I get 0.93e22 J/yr. where we want to calculate the temperature difference as a function of f2. All this would surely look better if (1) I knew more HTML, and (2) I was using Wordpress, which has an equation-maker plug-in, but I don't and I'm not. Now, what's the mass of the troposphere? About 80% of the total atmospheric mass, or 4.1e18 kg. Here ct is the troposphere's specific heat. I'll assume the troposphere is homogeneous throughout, and approximate its specific heat by the specific heat of air at typical room conditions and 40% humidity, which is 1,012 J/kgK. which seems like it could be in the ball park. At least, it doesn't seem ridiculous. And the sign is right: more heat into the ocean means heat taken out of the troposphere, which lowers its temperature. which could well put a damper on the greenhouse warming of a decade or two. So just a little more heat going into the ocean (relatively little -- it's still a huge number of Joules) can noticeably cool the troposphere. Or even more noticeably for the surface, which holds even less heat then the troposphere (for, say, the top 2 meters of air above the surface). That's what I suspected, and the rough numbers seem to support that. "I do not wish to seem overdramatic, but I can only conclude from the information that is available to me, that the Members of the United Nations have perhaps ten years left in which to subordinate their ancient quarrels and launch a global partnership to curb the arms race, to improve the human environment, to defuse the population explosion, and to supply the required momentum to development efforts. If such a global partnership is not forged within the next decade, then I very much fear that the problems I have mentioned will have reached such staggering proportions that they will be beyond our capacity to control." -- U Thant, Secretary General of the United Nations, 1969, from the Introduction to The Limits to Growth (pg 14). As Wikipedia says, "the book continues to generate fervent debate...," and I'll leave it at that. NASA GISS's global temperature anomaly last month was the highest October in their records, and the 7th-warmest month ever, tied with last month. Here's the warming from any given year to today. The total warming according to GISS is now +0.88°C, which rounds to 0.9°C, instead of the "0.8°C" you usually see quoted. Update your vocabulary. Lauren is joining CSLDF from Dechert LLP, a top tier law firm after a multi-month hiring process. At Dechert she served as project manager on a high-profile $3 billion litigation initiative and she represented commercial and individual clients on cases involving FOIA requests and litigation over FOIA requests, discovery disputes, and defamation claims. Prior to working at Dechert, she held legal and policy positions at the U.S. Environmental Protection Agency. She has a law degree from the University of Pennsylvania Law School and a master's in Environmental Policy from the University of Pennsylvania. She will be based in NYC working in an office generously provided by the Sabin Center for Climate Change Law at the Columbia Law School. Here are some profiles of Lauren Kurtz: Linked In, Law360, State Bar of California, I hope she is prepared for an onslaught by the crazies. Does any other scientific field have its own lawyer(s)? "I readily confess a lingering frustration: uncertainties so infuse the issue of climate change that it is still impossible to rule out either mild or catastrophic outcomes, let alone provide confident probabilities for all the claims and counterclaims made about environmental problems." which is quoted in this paper which is interesting reading: "How science makes environmental controversies worse," Daniel Sarewitz, Environmental Science & Policy 7 (2004) 385-403. The Hadley Centre says it is "the longest instrumental record of temperature in the world.... The mean daily data series begins in 1772 and the mean monthly data in 1659.... These daily and monthly temperatures are representative of a roughly triangular area of the United Kingdom enclosed by Lancashire, London and Bristol. The monthly series, which begins in 1659, is the longest available instrumental record of temperature in the world." Isaac Newton was only 16 years old when CET recordkeeping began (though not by him). With a linear fit, CET's total warming is +0.94°C, and +0.91°C since 1975, and +0.95°C since 1900. I'm sure it's just a coincidence that almost all its the warming in the last 356 years has come in the last century, and in fact since 1975. Beware, though, that the 15-year trend is -0.35°C/decade, which obviously means we're entering an unprecedented global cooling era probably because the Sun has given up on Earth for now and is busy warming Mars, so filthy liberals can blame humans (and their robots) for climate change there, too. The soon-to-arise environmental group warning about global warming on Mars will be named 953000.org.